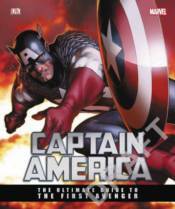 A comprehensive guide to Captain America, Captain America: The Ultimate Guide to the First Avenger is packed with information, stunning comic book artwork, and character history and is fundamental reading for any fan. Follow Steve Rogers's journey from the sickly and small Army volunteer to the iconic leader of the Avengers as well as his biggest adventures, battles, allies, and foes. Packed with information about friends, enemies, and storylines, this guide explores the exciting and rich history of the First Avenger.